International publisher Nina Jansous is the epitome of grace and style, and Blaze, her New York-based magazine has become one of the most successful in the world. Now Nina wants to return to Australia and re-launch an Australian edition of Blaze. Alisson Gruber, not yet 30, is unimpressed by Nina's decision to appoint her as editor of the Australian Blaze. Larissa Kelly, the 30-something chief-of-staff of Blaze New York, is sent out as Ali's deputy. 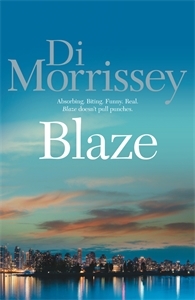 Joining Ali and Larissa on Blaze; is Miche Bannister, a young woman coming to terms with the suicide of her mother, the editor of the New York edition of Blaze. Four women whose paths are entwined are facing the same demons - coming to terms with their past and the present before embracing their future. The men they love, the men they find, the men they never knew, all play a role in a private dance on a very public stage.